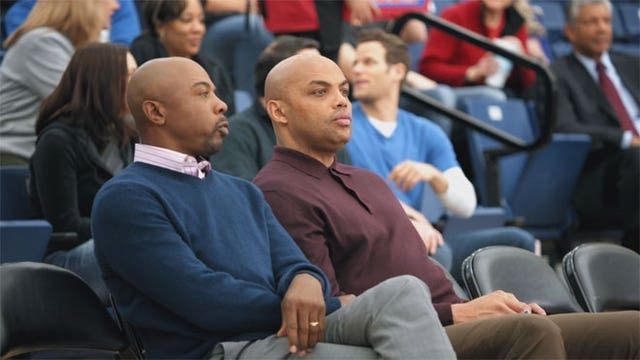 First on FOXBusiness.com: Capital One, a top-tier sponsor of the NCAA, provided FOX Business with an exclusive look at its new March Madness ad campaign featuring Charles Barkley and Greg Anthony. Capital One Financial (NYSE:COF), one of the NCAA’s three top-tier sponsors, is gearing up for a whirlwind of marketing activity during March Madness. The bank is in its fourth year as a corporate champion partner of the collegiate sports association. Along with AT&T (NYSE:T) and Coca-Cola (NYSE:KO), Capital One is a sponsor for every sport and gets major play during the men’s and women’s basketball tournaments. March Madness may be the biggest opportunity for Capital One to get the most out of its partnership with the NCAA. An average of 10.7 million people watched March Madness games in 2013, the most since 1994. Capital One’s plans this year continue to build on previous tournaments, with the company readying a full-court press to maximize its investment. “We’ve upped our game each year,” said Chris O’Neill, Capital One’s director of digital public relations campaigns. The company created several television and online ads featuring basketball analysts and former NBA stars Charles Barkley and Greg Anthony. The videos are set to begin running this weekend on Selection Sunday, when the NCAA reveals its tournament brackets. CBS (NYSE:CBS) and Time Warner’s (NYSE:TWX) Turner Broadcasting will again broadcast all 67 tournament games this year. A 30-second TV spot in the men’s championship game has a price tag of about $1.5 million, while a similar ad during the Final Four costs under $1 million. Last year, March Madness generated $1.15 billion in ad revenue, according to research firm Kantar Media. Capital One is leveraging the widespread audience for March Madness to engage fans on multiple fronts. The bank, known for its tagline “What’s in your wallet?” in TV ads, is prepared to reach viewers who follow the action through live streaming on computers and mobile devices. In addition to the new basketball-themed ads, O’Neill said the company “engages very heavily on the social front” during March Madness. Capital One is also the main sponsor for the NCAA’s online bracket challenge. This year, Capital One has a Q&A lined up with Sports Illustrated and CBS Sports writer Seth Davis, who will answer questions from Twitter (NYSE:TWTR) users on Monday. Also in the works is a social program for the Sweet 16. Capital One plans to give away $1,500 to randomly chosen fans who send Twitter messages with #KaChing, a reference to the cash-back benefits of the company’s Quicksilver card. O’Neill said the NCAA sponsorship also affords the company an opportunity to get involved on a local level. For instance, a string of concerts early next month in Arlington, Texas, will feature all three corporate champion partners. AT&T Stadium in nearby Dallas will host the men’s championship on April 7. The NCAA March Madness Music Festival will begin three days before the title game. AT&T will sponsor a block party with country singer Jason Aldean. A concert featuring Tim McGraw will be sponsored by Coke Zero. On April 6, Bruce Springsteen will close the Capital One JamFest. “Capital One tries very hard, whether on TV, in Dallas or on Twitter handles, to be where the fans are,” O’Neill said. Beyond March Madness, Capital One has exclusive promotional rights for credit card and retail banking during each of the NCAA’s 88 championships. Getting involved as a sponsor of all sports allows Capital One to stay active year-round, O’Neill noted. The company also sponsors NCAA football’s Capital One Bowl and the Capital One Cup, which recognizes the top sports program for men and women. At the end of the sports year, Capital One will award the winning schools a combined $400,000 in student-athlete scholarships. O’Neill explained that Capital One has seen the benefits of partnering with the NCAA, and March Madness is central to its role as a sponsor. An estimated 83% of all NCAA tournament viewers have used a credit card in the past three months, making them 12% more likely to pay with plastic than the average U.S. adults. Meanwhile, nearly one-third of NCAA tournament viewers have a household income of at least $100,000. Perhaps the best sign of success for Capital One? A survey conducted for the Sports Business Journal by Turnkey Sports & Entertainment found that 37% of respondents correctly identified Capital One as the NCAA’s official credit card, outpacing all other sponsors.